When everybody lies sleep at home, we will be waking up to getting ready for an amazing experience which does not repeat many times to conquer the desert before the very early light lines rise up. 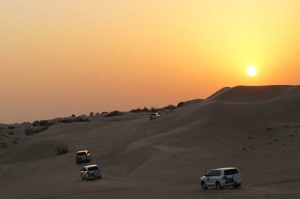 Your tour guid will pick you up from hotel and directly drive heading one of the highest points at desert where you can catch sunrise scene and smell the very fresh air of the new day. Then you drive again in the desert to explore this new world of nature and will stop later for a unique photo stop on the sand dunes. Next stop will be for sand skiing activity when you can live pleased and cheerful moments. By the end of tour you will drive back to hotel.